Your Outcome: Learn how to use Daily Outcomes to identify 3 outcomes or 3 Wins for today. By identifying your best 3 Wins for the day, you’ll be able to focus and prioritize throughout the day to achieve better results. 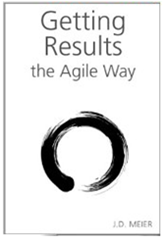 Welcome to Day 3 of 7 Days of Agile Results. Agile Results is the productivity system introduced in my best-selling time management book, Getting Results the Agile Way. On Day 1 of Agile Results – Sunday (Getting Started), we took a quick look at how to use Agile Results to support us throughout the week. Now, for today, let’s get started. It’s time for a fresh start. This is your chance to choose the best things to focus on that will help you make the most impact today. Scan your calendar so you can get a good picture of the key events in your day. You want to get a good sense of the priorities. Write down a simple list of the key tasks you have on your plate for today. Now, at the top of your list, identify 3 outcomes that would make this a great day. Think of these as your 3 Wins for today, to help you focus and prioritize throughout your day. Those then act as my “tests for success” for the day. Do I have a lot of tasks on my plate for the day? You bet. Do I have a lot of meetings to attend? Yep. Will I be trying to use some of the little time slices in my day to try and complete many of my tasks? Of course. Will I be dealing with interruptions throughout the day, as well? Yes, to that, too. I will be dealing with chaos while riding the dragon. And throughout the day, I’ll be driving to my 3 outcomes. They are my North Star, while I deal with whatever comes my way throughout the day. May your 3 Wins guide you and provide you with clarity, conviction, and calmness among the chaos – TODAY.